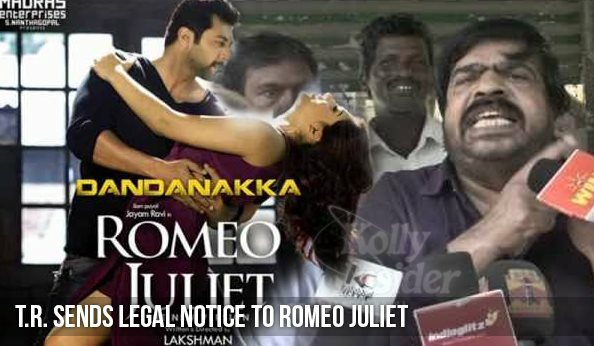 Actor-filmmaker T. Rajendar on Monday sent a legal notice to the crew of upcoming Jayam Ravi-starrer Tamil romantic-comedy "Romeo Juliet" restraining them from using the song "Dandanakka' in their film. The song, which was meant to be a tribute to Rajendar, has not gone down too well with him. "Rajendar sir is upset with the fact that the song has not been received well by his fans. Although the makers of 'Romeo Juliet' claim it's a tribute, it has only paved way to memes and funny mash up videos. It has not been received positively, and that's why a legal notice has been sent to the team," a source close to Rajendar told. After its release online a few weeks ago, the song became an instant hit. But audiences made it seem like a funny tribute to Rajendar -- popularly known as TR. A day after the release of the song, actor Jayam Ravi clarified that the song was not meant to demean T Rajendar. "My character is inspired by TR sir. I play his biggest fan in the movie. The song is a tribute to him. But certain videos are showing him in bad light, which hurts all those involved in the making of the project," Ravi tweeted. The legal notice has been sent to the film's producer Nandagopal, director Lakshman, composer Imman, writer Rokesh and actor Jayam Ravi.